1. The Ukraine blowup. The United States and the European Union are considering sanctions against Ukraine after violent clashes have left 26 people dead and hundreds more injured. Anti-government demonstrators have been protesting in the country's capital Kiev since November, when President President Viktor Yanukovych reversed a decision to sign a trade deal with the E.U. and instead forge closer ties with Russia. 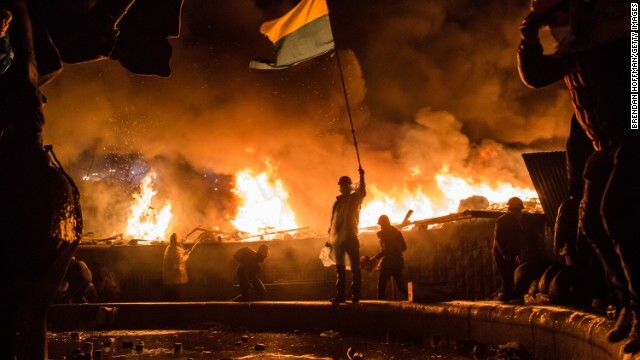 Ukraine's foreign minister told CNN extremist groups and opposition parties are responsible for the violence, but the Obama administration disagrees. "We hold the Ukranian government primarily responsible for making sure that it is dealing with peaceful protesters in an appropriate way, that the Ukrainian people are able to assemble and speak freely about their interests without fear of repression," President Obama said. 2. Sen. Rand Paul's voter rights fight. The Kentucky Republican returned to his home state to testify in favor of a measure that would restore voting rights to ex-convicts. It's part of his larger pushback against the war on drugs. "Not only is the incarceration unfair... but then they get out and their voting rights are impaired," Paul told a Kentucky state senate committee. The issue is one in which Paul, a potential 2016 presidential candidate, is in rare agreement with the White House. President Obama's attorney general Eric Holder is also calling for the restoration of voting rights for felons after they are released from prison. 3. CPAC opens arms to gay group. After years of being shut out, a gay rights group will be welcomed at a high-profile gathering of conservatives this year. GOProud is attending the Conservative Political Action Conference in Washington next month. "CPAC is about finding conservative solutions to every challenge in America and not just saying 'no,' " said Al Cardenas, chairman of the American Conservative Union, which runs the conference. "We're determined to win the majority of American support." In the past, a number of socially conservative groups objected to GOProud participating in CPAC. We really just want to be part of the conservative movement," said Ross Hemminger, a member of GOProud. "We want to establish a fruitful and respectful relationship."